If it has to do with Japan, the Kodansha Encyclopedia of Japan [KEOJ] has it." Thus exaggerates the advertising of "the most comprehensive reference source on Japan ever published anywhere." But the marketing hype fails to conceal the drawbacks of an over-priced national cornucopia of uneven quality that looks, in an age of computers, like a shelf of clay tablets in a museum. 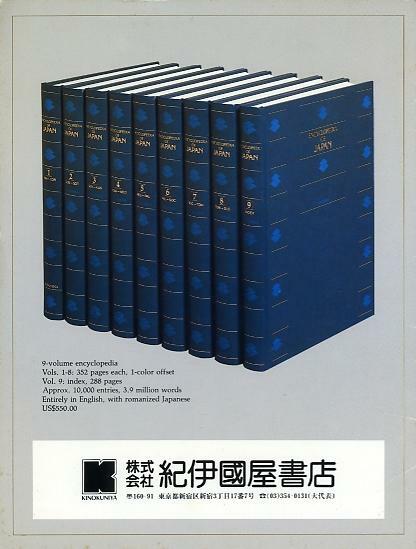 The encyclopedia (published in November 1983) is aimed at two kinds of users: the ignorant or misinformed foreigner who finds Japan's economic prowess enigmatic or intimidating, and the	omniscient "internationally minded"	Japanese who believes he lacks	only the ability to explain all the riddles in convincing English. KEOJ's debut came together with a number of studies, surveys, and exhibitions concerning the "information gap" that some Japanese have blamed for "the most misunderstood nation's" apparent difficulties in international relations. A report by the Posts and Telecommunications Ministry concluded that Japan is a less advanced nation in the "information trade" because it exports only about one-fifth the amount of information it imports. A government-backed group in New York found that only 3% of the 100 upper-middle-class Manhattan residents it polled could name Japan's prime minister. And a Tokyo subsidiary of the Ministry of Foreign	Affairs publicly displayed a collection	of foreign textbooks which demonstrated how Japan is mistaught in other countries. Now suddenly all those untutored foreigners who think Japan is a part of China are supposed to invest Y140,000 (US$600) in a heavy nine-volume encyclopedia in order to learn that sake is a "brewed alcoholic beverage made from fermented rice." This much you could have learned from your US$1.95 pocket Random House. Unlike a dictionary definition, however, KEOJ's 1,000-word signed article on sake goes on to explain everything that the soberest scholar would ever want to know about this marvellous beverage -- except where to buy it, how it tastes, and what it does to you when you drink too much. For such insights you will have to visit your local Japanese bar, and befriend a Japanese man or woman inebriated enough to tell you why it is necessary "to drink sake while appreciating the beauty of nature, especially the moon, flowers, and newly fallen snow (which KEOJ assures you marine boundaries with its closest is "still a popular Japanese custom"). But then you will discover that most Japanese people do not know enough about their own country to confirm whether such statements about sake are generally true or not -- and moreover do not really care until faced by an inquisitive foreigner who does. This is why advertising in Japan has been baited with guilt-inducers such as "How well could you explain Japan in English?" In fact, Kodansha counted on domestic users to buy about half of the first printing of 15,000 sets, and some 6,000 of the 10,000 sets sold so far have been bought in Japan. Kodansha is also proud that KEOJ has information about Japan, particularly in articles written by non-Japanese, that is not available from Japanese language sources. Nearly half of KEOJ's 1,200 contributors are non-Japanese, which is evidence that some things about Japan are already sufficiently understood by outsiders to entrust them with the task of educating others, including Japanese. But Kodansha president Koremichi Noma wrote things in his foreword suggesting that he has yet to read his own encyclopedia. "Any country that has one language, is surrounded on all sides by the sea, shares no boundary with another nation, and possesses a long history as well will naturally come to have its own characteristic culture and way of life," Noma writes, as though the same could not be said for countries which have several languages, are land-locked by a dozen other states and boast much shorter national histories. A one-page signed article on the "Territory of Japan" discusses international conflicts that exist precisely because Japan, as an archipelago, shares marine boundaries with its closest neighbors -- China, Korea, and the Soviet Union -- and has significant territorial disputes with all three. Yet other articles make it clear that in the course of Japan's 1500-year history as a nation, and until the end of World War II, its boundaries continually expanded into neighbouring non-Yamato territories -- first within the main archipelago, then to adjacent islands including Okinawa and Formosa, and from there to Korea, China and Southeast Asia. Noma blames Japan's "geographical circumstances" for "[a lack of] opportunity to become known to other countries" and "a national character that makes a virtue of not speaking about oneself." But an incisive two-page article by a Japanese anthropologist on the "Japanese People, Psychology of" thoroughly debunks the concept of "Japanese national character" as a product of the kind of "psychological reductionism" which engenders the many stereotypes that Japanese like to entertain about "our small island country." Some of the articles will, unfortunately, heighten rather than lower the "difficult barriers" mentioned by Harvard professor emeritus Edwin O. Reischauer in his introduction. KEOJ was produced by two editorial groups, one in Cambridge, Massachusetts, and the other in Tokyo. And the selection and writing of many of the articles clearly mirror imbalances and biases inherent in so-called "Japanese studies" in the US and "national studies" in Japan. History and the tradition arts were predictably allocated more space than popular culture or social problems. "Baseball" got an unimpressively written three-quarter-page article with a more respectable half-page table of baseball records, but Oh Sadaharu, the sport's living hero, got a mere one-eighth-page entry with a misleading statement about his parentage. "Wrestling" got a similarly short one-eighth-page article which mentions only in passing the inimitable Rikidozan, a post-war grappler of Korean descent who dominated the ring until his murder in 1963. The 700,000 Americans of Japanese ancestry, who account for only about 0.3% of the US population, got no less than 20 independent articles totalling nearly nine pages, most of which focus on experiences of discrimination. But the plight of a similar number of Koreans in Japan, who constitute 0.6% of Japan's population and have suffered far more than Japanese Americans, got only a single one-page article. American poet Gary Snyder, whose writings have been influenced by Japan but have contributed very little to an understanding of its culture and society, got a signed article running nearly half a page. In contrast, former prime minister Kakuei Tanaka, a political personality of enormous importance, rated less than one-quarter of a page in an unsigned article clumsily written in the manner of an obituary filed before a famous person dies in case the reporter is out fishing at the time. Conceived about two decades ago, the encyclopedia was not begun until 1974. With a target date of 1979 it took nearly twice as long to complete. 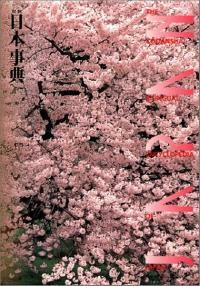 Kodansha has promised a supplement in 1986, and a revised second edition when necessary and feasible. Articles are geared to the 1980 census, but Japan conducts a national head count every five years. And various public and private groups continually compile and publish an impressive assortment of statistics which are quickly reported in a variety of useful forms. Hence KEOJ has a realistic half-life of only a couple of years, and will radiate very little current information by 1990 even in such a field as ancient history. Although a bumpy road in a well-intended direction, the encyclopedia has a long way to go to achieve the standards of coverage and accuracy demanded by the critical reader. In future editions, editorial standards will have to be higher, the price will have to come down, and easily updated database versions will have to be offered for videophiles who find bulky books a bother. But the most problematic aspect of KEOJ lies in the reason for its genesis. Many Japanese feel that other countries are better off than Japan because these nations are better understood by foreigners who know at least the names of their capital cities and national flowers. It is therefore presumed that an increase in the number of foreigners knowing such things about Japan would ipso facto improve Japan's foreign relations. Japanese are hardly the only people who believe in magic remedies. But many Japanese opinion leaders seem to regard such things as KEOJ as a kind of kamikaze (divine wind) which will shield Japan from the missiles of misunderstanding just like the typhoons which turned back the Mongol hordes attempting to invade Japan in the 13th century. Few Japanese seem to wonder why, if knowing facts reduces friction, so many of the nations that allegedly enjoy greater mutual understanding with one another than with Japan are embroiled in cold and hot wars which Japanese seem quite happy to be without and stay out of. One difficulty with the Japanese equation of "understanding" with "harmony" is that the Japanese word for "understanding" includes the idea of "acceptance." Hence "understanding Japan" for many Japanese means "accepting Japan" as they do. A number of Japanese trade-policy negotiators appear to believe that foreigners who truly understood Japan would naturally tolerate Japan's non-tariff barriers. There is also the nasty problem of whether Japanese can understand others if they insist, as many do, that others cannot understand them. Noma claims that Japan "[is no longer] about to overlook any misunderstanding or lack of understanding on the part of other nations." He tellingly overlooks how Japan has contributed to its own "unfavourable information imbalance" by being a cultural black hole which, over the centuries, has sucked in every foreign technology and art that its people have ever wanted, while many Japanese have insisted that foreigners cannot understand Japan even when they devote their lives to experiencing and studying its culture and society. Japanese also tend to feel that the deluge of information from other countries into Japan has endowed them with a superior understanding of other peoples. However, a close look at Japan's own media and textbooks reveals that this is not the case. Japanese know a lot, to be sure. But just as in other countries, Japan's collective understanding of itself and other nations tends to be selective and distorted in ways primarily beneficial to its own national identity. By appealing to the "rescue fantasy" of Japanese who would save their country from foreign ignorance, KEOJ exploits the delusions of persecution that are part of Japan's largely hysterical information gap syndrome. One can only hope that foreigners who read Noma's foreword will not conclude that a people who indulge in such self-pity deserve to be misunderstood. People from all walks of life rely on library and Internet sources, including hardcopy and on-line encyclopedias. The Kodansha Encyclopedia of Japan (KEOJ) is no better or worse than most such compendia -- which means it is not, on the whole, as reliable as one would like. KEOJ is included here as an example of how information about Japan can be wrong or misleading -- even when found in what appears to be an authorative Japanese publication. The original KEOJ has since evolved into an searchable on-line version published by Palgrave Macmillan. Shortly after the official start of the KEOJ project I was asked to contribute an entry on foreigners in Japan. I was never told what other entries mine would be complementing or who would be writing them. In the process of discovering all this I learned that no one in the editorial ranks had a clear vision of what exactly "foreigners" should mean. As I was then party to a law suit claiming that the gender discrimination in Japan's Nationality Law at the time was unconstituional, I assumed that "foreigners" meant "non-Japanse" as defined by this law. Hence foreigners would include Koreans, Chinese, Americans, Nigerians -- i.e., anyone not a member of a family register in Japan -- regardless of race or ethincity, which have no bearing on determinations of Japanese nationality. However, an editor informed me that I was expected to write about "Westerners" and "gaijin". I refused. That would be both racialist and racist. I persisted and was eventually allowed to describe "foreigners" in the strictly civil (legalist) sense that I understood the term. My contribution turned out to be a medium-length signed article called foreigners in Japan. It followed foreigners, attitudes toward by Hiroshi Wagatsuma, who was one of the professors on the planning committe. Wagatsuma, who I knew, had recommended that I be asked to contribute, though I was then still a student. There were other articles on foreigners, and other categorical minorities, foreigners and Japanese, many of them written by professors I knew. Taken as a set, however, they betray the uneven quality of the encyclopedia regarding editorial consistency as to what "Japanese" should mean in contrast with "foreigners". The whole point of the KEOJ project was to save Japan from foreign ignorance. It was hoped foreigners would read it and wake up -- after falling asleep by page three of Volume 1 and subliminally absorbing all nine-volumes -- with a "correct" understanding of Japan. And Japanese would read it in order to help them explain Japan in English to foreingers. But immediately following my own contribution is a fine example of why the accuracy of KEOJ cannot be taken for granted. The item consists of only one paragraph (KEOJ, Volume 2, page 314). The writer is elsewhere identified as a professor in the Department of Art and Science at Tsuda College in Tokyo. But the purple passages are wrong. Japan regards all its nationals as Japanese regardless of whether they are also nationals of other countries. And aliens are allowed to own land. Several other statements, including the one about alien entry and departure, are also highly misleading. For example, all people entering and leaving Japan are "legally regulated" at ports of entry and disembarkation -- regardless of nationality. And the word is "nationality" -- not citizenship. Japan's Nationality Law confers only nationality. Other laws determine qualities of citizenship, and nationality is only one factor. The nine-volume KEOJ was reissued by Kodansha America in 1987 and a supplementary volume was also released that year. The ten volumes were revised, updated, and compressed into the two-volume Japan: An Illustrated Encyclopedia, which was published as a boxed set in 1993 by Kodansha International. Other spinoffs include the one-volume Kodansha Bilingual Encyclopedia of Japan in 1998. I was twice, in 1994 and 1998, paid 2000 yen for the privilege of being allowed to permit Kodansha International to recycle my article -- which was edited and cut, without my permission, and eventually without my name. A fully searchable on-line edition of KEOJ, accessable only to subscribing libraries and instituions, was launched by Palgrave Macmillan in February 2002. The following "Introduction" was cut and pasted from http://www.ency-japan. In the course of the past two decades, Japan's power to affect the rest of our planet has grown at an astonishing rate. The global reach of Japanese industry and finance and the transformative impact of Japanese technology have been felt in almost every country. Yet Japan remains an enigma to most people, inspiring unease and distrust in addition to admiration and curiosity. In part, this is because Japan has faced more formidable barriers to the export of its cultural, artistic, and intellectual accomplishments than it has to the products of its industries. Even today, the volume of information on Japan that reaches other countries is pitifully small in comparison to need. This encyclopedia serves as an attempt to redress this imbalance. It is conceived as a single, comprehensive resource that will give the interested reader a key to unlocking the complex society of late-20th-century Japan. It contains a wealth of hard data on Japanese politics, government, economics and corporate behavior, but it is also a treasury of Japanese art, culture, and history and a guide to the more subtle traditions that have shaped Japanese life and thought throughout the centuries. Our hope is that this encyclopedia will serve not only as a ready reference for those seeking specific information, but also as an enjoyable and instructive tool for those who wish to add depth and perspective to their image of Japan and the Japanese. The Encyclopedia of Japan website naturally has its own history, and a word here would seem appropriate. This digital reference work is based on Japan: An Illustrated Encyclopedia, published in 1993, and it contains almost all of the 11,000 main-text entries of that book, thousands of which have been updated to reflect changes occurring in the 1990s. There are also 150 new entries on notable people, companies, events, trends, etc, of the last decade. The main-text entries range in length from 50 words to more than 4,000 and cover every aspect of Japanese culture and society from prehistory to contemporary science and technology. They are the work of some 1,400 scholars and specialists from Japan and 27 other countries as well, as an international editorial staff. Japan: An Illustrated Encyclopedia was, in turn, based on the nine-volume Kodansha Encyclopedia of Japan, published in 1983. The nine-volume encyclopedia has been widely acknowledged as a landmark in English-language writing and scholarship on Japan. Hype is arguably an essential element of advertising and history.